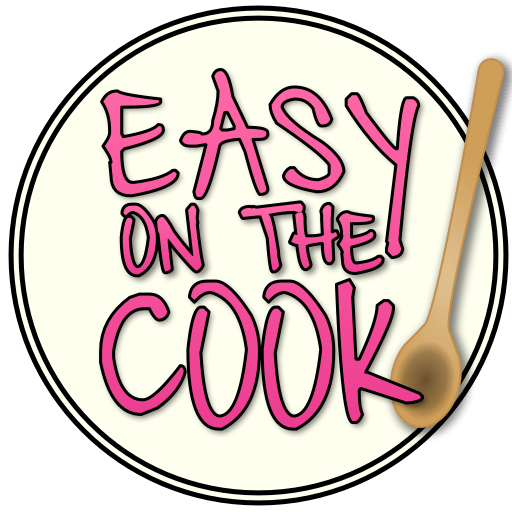 Easy Caramel Sauce – Step by Step Instructions. Caramel sauce doesn’t have to be difficult. It’s melted sugar and cream, but it’s melted sugar and cream that tastes like heaven on a spoon! I keep my sauce as simple as possible. 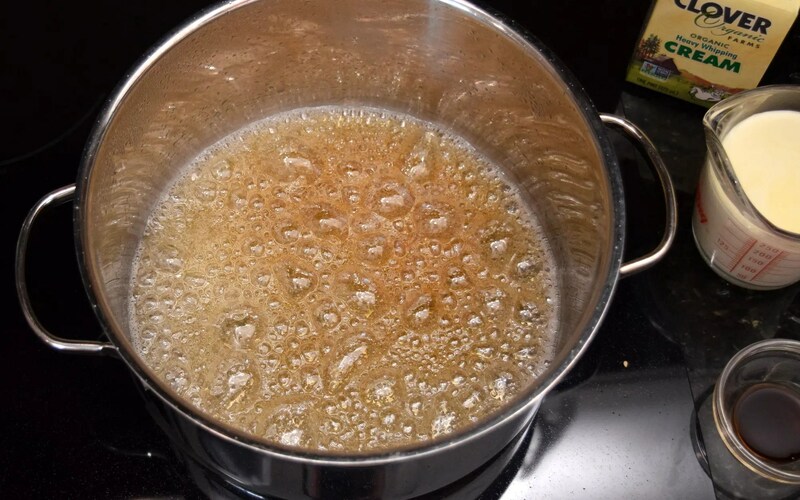 I often think people run into difficulties making caramel sauce because they are using an electric stove when the recipe is made with a gas stove. I think that a gas stove is helpful because one can control the heat so quickly, which is important in making caramel. That being said, it’s not impossible to make it on an electric stove. In fact that’s all I have in my house since I moved to California. 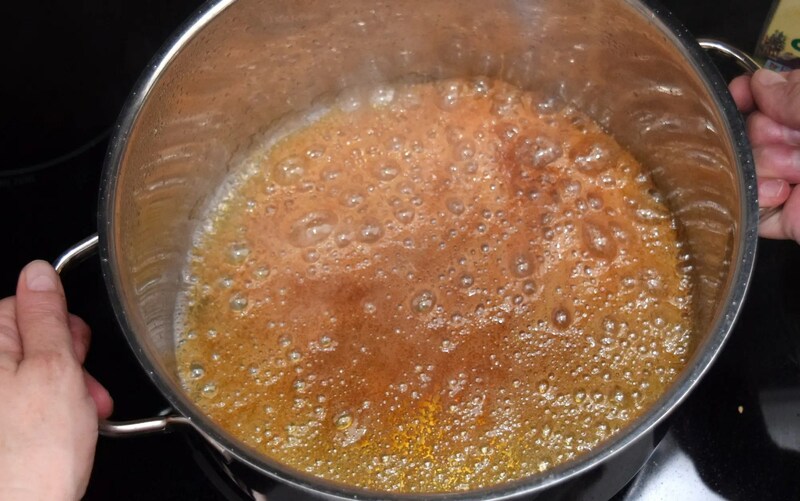 So this recipe includes tips for making caramel on an electric stove. Start by mixing the water and sugar together in a large pot. Try not to get the mixture up the sides of the pot. Next transfer the pot to a preheated burner and bring the mixture to a boil! It’s also important to make sure your pot is the same size as your burner on the electric stove. You don’t want a pot smaller than the burner or the sides of the pot will get too hot. If the pot is larger than the burner the middle will cook before the edges. Do not stir with a spoon, just swish the pan around. You’ll note in the picture I have the rest of the ingredients close at hand. I have warmed the cream in the microwave so it’s close to room temperature. 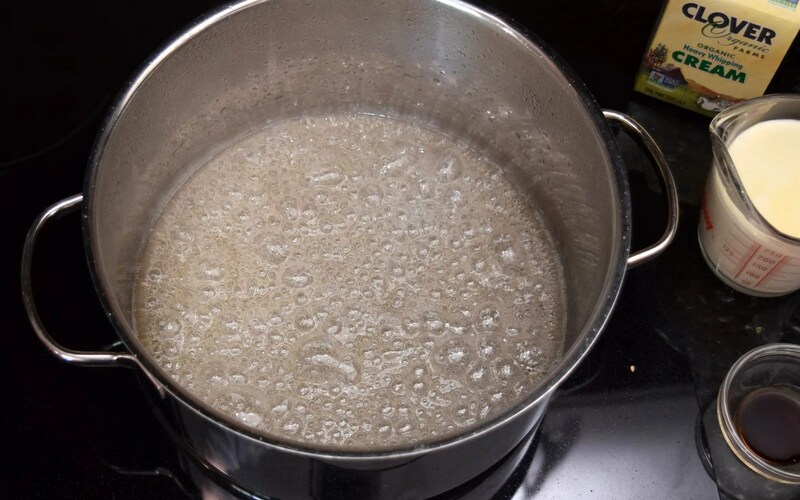 On my electric stove on low, it takes about 12 minutes to get the sugar water mixture to the point where it has thickened and starts to turn brown. When the syrup starts to turn brown it gets dark quickly so watch carefully. I swish the pan to try and get it browning as evenly as possible. You might notice that I am not using a candy thermometer. Every time I have tried making caramel sauce with a candy thermometer it’s been disaster. I think I spend too much time fiddling with the thermometer and the sauce overcooks. Now I just watch the color. I think if you are making candy the thermometer is more important, but this is sauce so it’s more forgiving. When it’s the color of brown I want I add in the cream and start stirring. The cream will bubble up, that’s why I use a large pot. The cream will stop the sugar from cooking more. It may feel like the caramel is hardening at the bottom of the pot but keep stirring. Return it to the burner at low heat if necessary. Keep stirring until sauce is smooth. I find it takes 3 – 5 minutes to incorporate the cream with the sauce. Pour the sauce into a container and allow to cool at room temperature. The sauce will thicken as it cools. Now the hard part: try to not eat it all before you put it on your dessert! 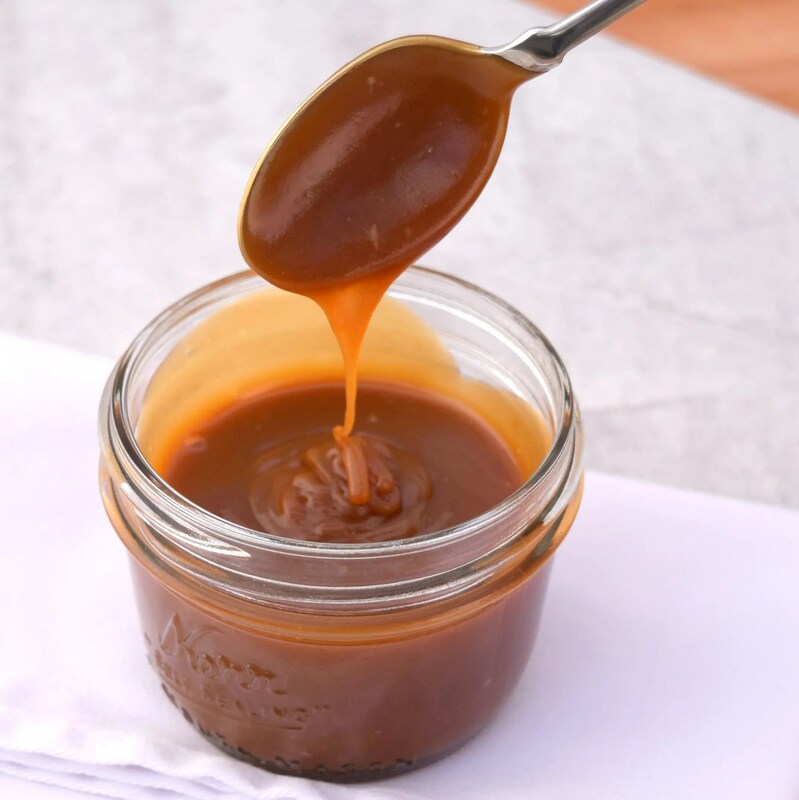 Homemade caramel sauce with step by step instructions. Microwave or heat whipping cream for a few minutes until it is room temperature. In a large pot stir together the water and sugar. Place pot on low heat. Allow sugar mixture to come to a boil. Do not stir, only "swish " from time to time being careful not to get the sugar mixture up the sides of the pot . Sugar mixture will slowly thicken as the water evaporates. On my electric stove on low heat this process takes about 12 minutes. 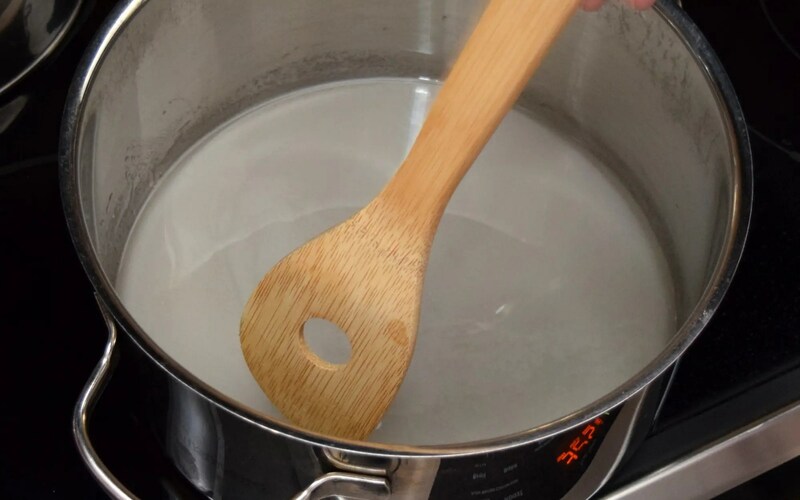 When sugar mixture is thick it will turn from a light brown to a dark brown in a matter of seconds so watch carefully swishing the pot to keep the sugar browning evenly. I generally like my caramel sauce a rich chestnut brown. As soon as the sugar is the color you like, remove from the heat and add the cream. The cream will bubble up in the pot. Start stirring vigorously. Add in the vanilla and keep stirring. 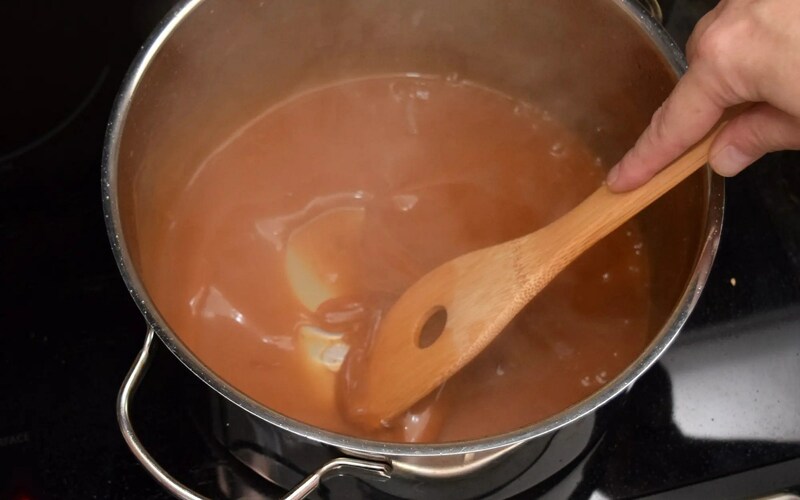 It might feel like the caramel is solid in the bottom of the pot but don't worry keep stirring, returning the pot to low heat if necessary. 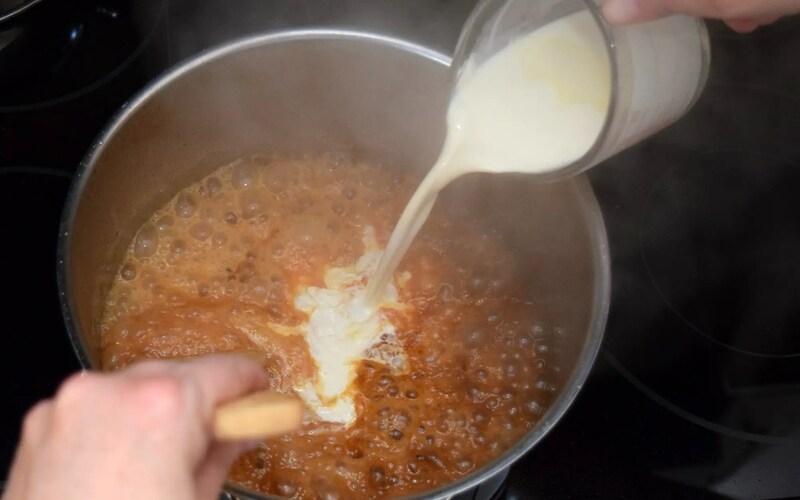 I find it takes 3-5 minutes of stirring to incorporate all of the caramel with the cream. Sauce will thicken more as it cools. It will last in the fridge in a tightly sealed jar about 2 weeks - if you don't eat it all!